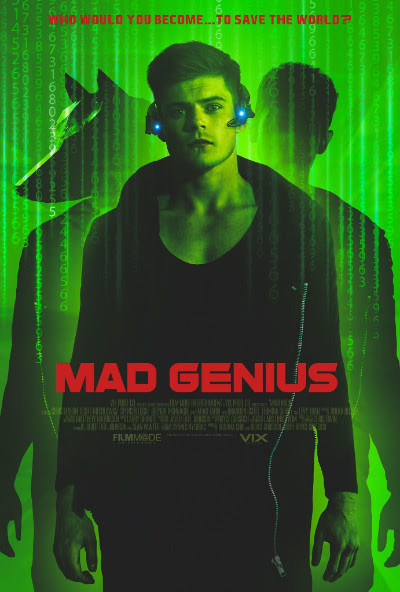 Hacker, Eco warrior and YouTube sensation Mr. Vix otherwise known as Mason goes on a one man crusade to reprogram the human brain. Well, he's not completely on his own. In a previous attempt/experiment Mason accidentally conjured up a more confident, arrogant and violent manifestation of his personality that only he can see named Finn. Finn acts as devils advocate to Masons kind of more nervous nature and convinces him that what he is doing will save humanity. Between them they manage to procure a brain mapping device from an evil genius wanting to use it to eliminate the human race entirely. Question is can Mason figure out how to make his theory work and save humanity or is this just his mind playing tricks on him and he is really just sinking further and further into total madness??! Starting off very promising with a heavy FIGHT CLUB vibe but unfortunately goes a bit downhill after they get their hands on the mind mapping device. Acting wise it's pretty good but script and ensuing dialogue bog it down and makes it quite forced in places. Chris Mason (Legend) and Scott Mechlowicz (Peaceful Warrior) work well together as Mason and Finn and are both very easy on the eye. Spencer Locke (Insidious: The Last Key) has a small role as Masons neighbour/love interest but doesn't feature in it much at all, and Faran Tahir as antagonist Eden is good but loses a bit of appeal with his rather bizarre weapon. Apart from this slightly misplaced weapon the rest of the special and visual effects are stunning. Masons mask and some of the other graphics are particularly vibrant. Great to see given its low budget, often with movies like this the effects are the first to suffer. The use of live social media streaming and running comments is a nice touch too but towards the middle and end it kind of loses its train of thought and gets a bit confusing. More sci fi then horror it does very briefly touch on a good eco horror idea which I would've liked to have seen them elaborate on but sadly did not. However, I liked the idea of this movie and thought it was a good watch.